One of the Bible’s most beautiful stories comes to a fitting end. The elders of Bethlehem recognized God’s hand at work and pronounced a blessing on Ruth and Boaz. It seems that the greatest joy was Naomi’s, because the birth of Obed (meaning "servant") reversed the family’s desperate situation. The Bible is careful to note that it was God who gave this child to Boaz and Ruth. 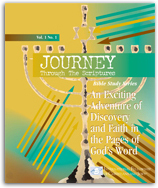 Naomi’s "bitter" sojourn in Moab and blessing upon returning to Bethlehem, along with Ruth’s status as a foreigner who was not part of the congregation of the Lord, remind us that we are never so far away from God that we cannot return to Him. What’s more, God loves us even in the midst of hardship and hopelessness, and He is able to bless us despite our circumstances. Calling Ruth "better than seven sons" was the highest compliment the women of Bethlehem could have paid her. This remarkable woman from Moab was a worthy addition to the Messianic line of David-which is a key point of the story. The book of Ruth is not just the account of people who acted faithfully in Israel during the faithless days of the judges. It is also the story of how God rewarded that faithfulness by bringing from Ruth’s and Boaz’s line the great king, David. David would not only bring Israel to its days of greatest glory, but also foreshadow the coming of the nation’s greatest Kinsman-Redeemer, the Messiah. The elders prayed Ruth would become like Rachel and Leah, the mothers of Israel’s twelve tribes. In what way did Ruth play a significant role as a mother and matriarch in Israel? Do you think the reference to God’s activity in regard to Obed’s birth means simply that Ruth was unable to conceive? If not, what else could the writer be referring to? What term did the women of Bethlehem use (Ruth 4:17) to describe the close relationship that Naomi felt to Obed? What can we learn from the story of Ruth that will help us during those times when our circumstances seem bitter and it appears that God has forgotten about us? It is exciting to read time and again how God did the seemingly impossible in Ruth’s life. But when it comes to our own lives, we are often tempted to think, "That was then, and this is now." Are you facing an obstacle that seems impossible to remove, or a problem that appears too big to solve? God can make a way where there seems to be no way, so keep trusting Him.